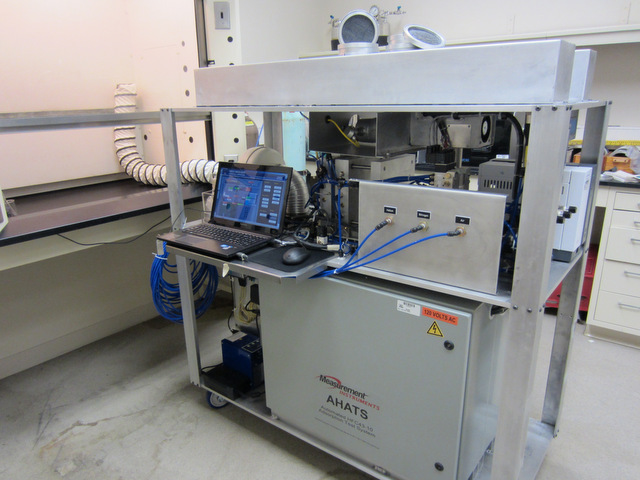 The Automated HFC43-10 Adsorption Test System (AHATS) is an adsorption cell test center used for testing a fabrics’ resistance to chemicals. Measurement Instruments will include a complete turnkey system including design, fabrication and commissioning of the system, complying with MIL-DTL-32130 procedure. Housing for fabric test samples. A material handling system allowing multiple test samples to be automatically loaded, tested and unloaded from the system. A combined chiller/heater system produces a temperature controlled stream of water, maintained between 60°F and 70°F plus or minus 3°F, that flows through the adsorption cell to maintain a consistent cell temperature. An embedded thermocouple is used for the monitoring and control. 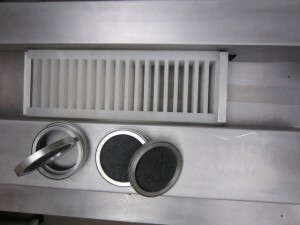 An electric heater preheats the test sample to a temperature between 80°F and 110°F to remove moisture, using compressed air at a rate of 20 cfm. 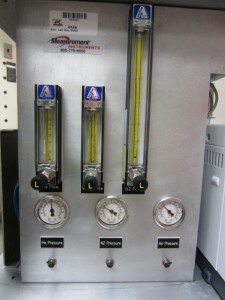 A nitrogen control system to deliver a specified flow of diluted nitrogen to the test cell. Gas pressure and temperature gauges. A gas chromatograph is used to analyze the composition of the nitrogen gas stream exiting through the fabric. A control and data acquisition system provides automated control of all equipment described above and automatically acquires and stores test data from the gas chromatograph. Human-Machine-Interface computer allows the system operator to set up a test, execute the test and observe the results of the test. Control of the adsorption test cell and all ancillary equipment will be performed using a commercially available programmable logic controller (PLC). Signals from all field devices, such as the mass flow sensors, thermocouples, pressure transducers and other devices will be connected to the PLC which then uses these sensor inputs to control the operation of the complete system. Internal networking of AHATS system. The PLC will be interfaced with the Human-Machine-Interface (HMI) using a standard Ethernet interface. This interface will be used to communicate set point and alarm data from the HMI to the PLC and to communicate process data from the PLC to the HMI. The HMI will consist of a Windows PC based system. 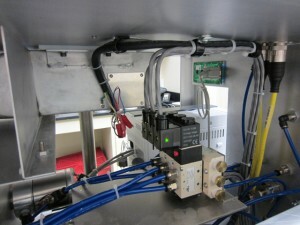 The HMI will provide a graphical interface of the entire test cell including the ancillary support equipment.